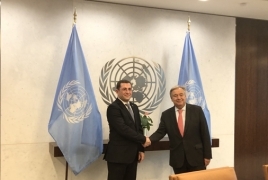 PanARMENIAN.Net - The new Permanent Representative of Armenia to the United Nations, Mher Margaryan, presented his credentials to UN Secretary-General António Guterres on Friday, August 31, the UN's website reveals. Before his latest appointment, Margaryan was Armenia's’s Deputy Permanent Representative to the United Nations since 2017. From 2015 to 2017, he was Minister Plenipotentiary to the Permanent Mission of Armenia to the United Nations Office at Geneva, Switzerland. He worked as Head of the European Union Division at Armenia’s Ministry of Foreign Affairs from 2009 to 2015. With Government experience exceeding two decades, Margaryan has served as First Secretary to Armenia’s Embassy to the United Kingdom from 2006 to 2009, as Head of the United Nations Division at the Department of International Organizations at his country’s Ministry of Foreign Affairs from 2005 to 2006, and Second Secretary to the Armenia’s Mission to the United Nations from 2001 to 2004. From 2000 to 2001, he served as Third Secretary at the Department of International Organizations at the United Nations Desk in Armenia’s Ministry of Foreign Affairs, where he also worked as an attaché from 1998 to 1999. Margaryan holds a degree in history and theory of international affairs from Yerevan State University in Armenia. Current Foreign Minister of Armenia Zohrab Mnatsakanyan used to serve as the country's Permanent Representative to the United Nations before.